Silipin is a shy, but extremely friendly fox. She's a bit curvy too, but the guys (and possibly some girls?) seem to enjoy it... maybe a little too much. She enjoys spending time with her mate, Rainbow Starfox, and her main hobby is art (and fursuit making, but technically it's me rather than her doing this stuff!) and going outdoors - mainly camping, swimming, fishing, hiking, etc. Silipin is a small fox, about 5'6". She's rather curvy and heavier-set, but she tries not to dwell on that too much. Her fur color is extremely light compared to most natural red fox fur, it's more yellow-orange than rusty orange. She has a cream-colored tail-tip and underfur, going from her muzzle down to her crotch. The insides of her ears are also cream-colored. Her arms and legs have brown "socks" going from the elbow/knee joint down, and her ear-tips are the same color. Her mouth is a natural fleshy color. Her nose and pawpads are a light pink color, and her eyes are a brilliant sky blue color. 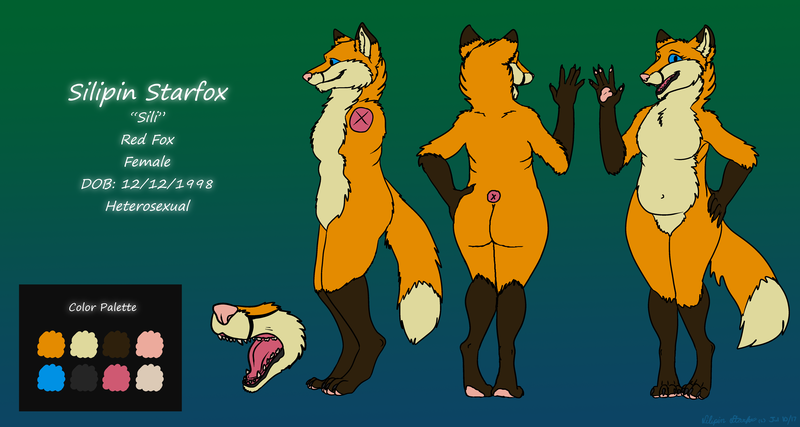 This is my fursona's reference sheet, done by me!
" Want to commission me? Please check out this link - it includes my terms and conditions, my prices, and examples!